I was very lucky making Kingdom. Not only did I have a horde of playtesters with appetites like feral cats (a good thing) but I had a rock solid brain trust: Caroline Hobbs, Marc Hobbs and Pat Kemp. It’s not just that I played a lot of great Kingdom games with them — though I definitely did. It’s that as Kingdom slowly and carefully evolved through versions one, two, three, four and five (and all the tiny sub-variations within each of those main versions), they provided sage counsel and carefully considered reflection about the direction the game was taking. As a game designer, it’s extremely valuable to have people who truly understand what you’re trying to do with the game — particularly when you aren’t there yet. They aren’t just giving advice that would make your game better in some universal sense, they’re trying to give advice that would make it be a better version of the game you’re trying to make. See the difference? It’s critical. That’s what makes them the Brain Trust. 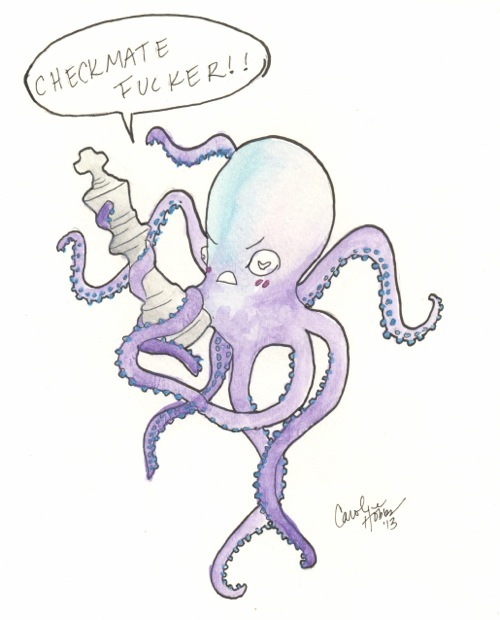 Caroline did the fantastic art that graces Kingdom, but did you know that over at Underwater Madness she paints funny and/or deeply bitter portraits of sea creatures in adult situations? It’s SFW. Mostly. Marc and Caroline design story games together (and sometimes separately) under the Less Than Three Games label. If Marc has a heart he’ll finish a version of Eden that you can try. We taught bears to murder and earned the respect of snakes because we showed we could lie. Pat makes games of the computer species. You can play a few of his creations at patkemp.com. Particularly check out Love Letter because it is super sweet. All three of them are also pillars of Story Games Seattle, but that goes without saying. I can’t tell you how many polite conversations over the last few years were interrupted by me saying, apropos of nothing, “So, Kingdom question…” and then rattling off some esoteric tweak in the rules that no sane person would notice. Caroline, Marc and Pat were always on it.